Homemade sunflower seed butter couldn’t be any easier to make, and the results are over the top delicious!! Unlike conventional store bought, YOU get to control the ingredients AND the fresh taste can not be beat! This requires no special skills. It is done in under 10 minutes. It is more frugal than store bought. And MOST importantly, the taste? You simply cannot compare it to anything you’d purchase!! My kids were lukewarm about sunflower seed butter until I started making my own. Now, we polish off one batch about once a week. I have been making my own sunflower seed butter for sometime now. Peanut butter used to be a staple in our house. Then my toddler started getting random hives in weird places around his body. After about a week of this, I finally figured it out: his older sisters had taken to peanut butter toast for the week, and their touches from unwashed hands were causing the hives! Now, with all peanut butter out of the house (a blood tests confirmed a high IgE to peanuts), we had to find a replacement. Peanut butter was such an easy form of healthy protein for my picky kids! Luckily, sunflower seed butter is equally as delicious, and my kids don’t notice the difference anymore. AND now they ask for it all the time! Ours have never lasted too long, but we had one jar out for three weeks, in the pantry with no issues. The oils in nuts and seeds do go rancid, so store in the fridge if you don’t mind it a bit firmer and don’t plan on consuming it within a few weeks. I used my 14 Cup Cuisenart Food Processor for this, and my Blend Tec. A touch of vanilla and/or cinnamon makes for a special treat! My kids love to mix in raisins and dip apples in it! SPECIAL UPDATE: DON’T ADD ANY WATER OR ANY WATER CONTAINING LIQUID TO YOUR NUT BUTTER….IT WILL CAUSE THE CREAMY NUT OR SEED BUTTER TO SEIZE AND CLUMP!! THE OILS IN THE BUTTER LITERALLY CLUMP TOGETHER AND REPEL THE WATER! Would like to try your sunflower seed butter in some recipes? A creamy, ultra-delicious spread for everything! 2-4 tablespoons avocado oil Play this by ear..some batches I add no oil, others I need to add 4 tablespoons, each batch of nuts or seeds and their oil content can be different! As mixture goes from a flour like consistency to clumping together (the oil is starting to be released from the heat of the machine and friction), add in 2 tablespoons of light tasting oil. Be patient, this can take a several minutes. Continue processing, and as the mixture continues to warm and the oils release, it should turn creamy and smooth and whir happily, easily inside the bowl. If not, it is OK to add a bit more oil until the mixture is runny and whirring smoothly. For an extra creamy punch, if you own a high powered blender, pour the mixture while still warm and liquidy into the blender cup and process one to two full cycles. (I have tried making it in my blender alone before and EVERY TIME it seemed like my blender was working WAY too hard to accomplish this, so I found the food processor/blender combo to be my best bet). If you do not have an high powered blender, it is also OK to process several more minutes in your processor for additional creaminess. Here is the progression of steps: flour, to clumping, to whirring smoothly, to blender cycle for creaminess. Wow thank you! I have cancer and been spending a LOT of time in the kitchen. I’ve chosen the to heal naturally so part of that is completely changing my diet to mostly Vegan, but I’m very thin so I eat eggs, chicken and fish to keep the protein up. That said I’m spending a lot more to eat good and was looking for ways to save! This is a game changer. Now I can’t wait to try my favorite.. Almond Butter! I want to make this for my son so he can sit next to his friend at lunch at school. Iv3 been buying sun butter from the store and its expensive and in thinking making it homemade will be cheaper. How long will this sit in the pantry before it goes bad? This sounds really delicious, have you tried other types of seeds? I really like the idea of using sesame seeds but not sure if they’re too small. What do you think? No Dave, I have not!! But I really love sesame seeds too! just made this and it came out great! Will be adding this into the rotation on a regular basis..thank you! Great Julie, happy to hear it!! I am due to make another batch too! Tessa, do you have any tips for finding fresh, non-bitter sunflower seeds? I so want to make our own, but every time I have tried, it is so bitter that I find myself trying to add all kids of flavor and sweetener to mask the bitterness. Do you find it better to buy pre-roasted or would I maybe have a better chance buying raw from a refrigerated section and then roasting them myself? Would appreciate any tips you can give. Thanks in advance. I’ve had another reader mention the bitterness…I have never experienced it. I buy the pre roasted, unsalted sunflower seeds at Trader Joe’s. Where are you getting yours? You can have room trmp spreadable sunbutter but still keep it from going bad quickly. Just use a larger container to store bulk of what you make in fridge and a smaller one to keep in cabinet for daily use. When small container finished you just refill from fridge batch. I also used a mix of toasted and untoasted seeds with no problem getting it smooth using the coconut oil. I really enjoyed this recipe. I used my Ninja, so I didn’t have to use an additional kitchen gadget/mixer/processor. I used 2 Tbsp coconut oil, 1/2 tsp honey, and 2 pinches of salt because I used unsalted sunflower seeds. I am not one to add sugar to butters but I found the honey took away some of the bitterness. Thanks for the inspiration! Hi from New Zealand! I don’t use Stevia (weird hang-up of mine) so could I use pure maple syrup instead? Could you please tell me the equivalent measurement to use? Many thanks! I would use a dry sweetener…it is really easy to make the butter seize with a liquid sweetener! I use coconut sugar as my sweetner! I am TOTALLY ADDICTED to this seed butter as I am severly allergic to peanuts. THANK YOU SO MUCH! we are too Elaine..thanks for your comment! Hi Margaret! The flavor comes from the seeds you use…so if they are bitter, than your butter will be bitter. sunflower seeds should not be bitter, so not sure what happened…try some new seeds and see if that fixes it. How much NUTRIENTS are lost when you say “baking in a 325 degree oven for about 15 minute”? you could always do it with raw ingredients as you prefer!! Everybody has to do what works for them! most of the nutrients are lost…..I recommend soaking the seeds, dehydrating them (at 117 degrees) til completely dry – then use those nuts for maximum benefits!!!!!!!! great Dina! We go through ours too fast for it to spoil, but longer than two weeks, I would refrigerate. Also, if you like a firmer consistency, refrigerate to firm up the oils! Just made this today! Thank you for the recipe! I have a Black and Decker food processor and it worked wonderfully! Came out great. Thanks so much! great Jaime, thanks for leaving feedback and letting us know your processor worked! I am using my Champion Juicer with the homogenizer attachment. Works wonderfully. Oh my god..I’ve just made it. I have started on a candida diet few days ago..and I just had to eat something good, and filling and something anti candida. I have a very bad blender, but since I didnt want to add more oil I add some water..of course it turned out not so creamy as yours, but anyway it was amazing treat and just what I needed. I must get a proper food processor/blender. Thank you! hang in there Estelle!! Any diet change can be tough in the beginning…but after a few weeks…it gets easier! I just made half a batch using olive oil and honey. As some people mentioned before after adding honey it hardened and turned pasty and stiff. To solve this just add a bit more oil and keep processing. It will go from flour, to clamping to whirring smoothly till it eventually turns into butter consistency again. I think it is the amount of oil (either released from the seeds or added) that determines the smoothnes. Good insight Melita, thanks for sharing it! This turned out an excellent product. I used one cup of seeds to try this out and light olive oil. I used a Nutri-bullet nut blade to blend it. I came across your recipe looking for sunflower seed butter. Sunflower seeds have great nutritional value and I will be doing this often. awesome pam, thanks for letting me know. awesome pen, thanks for letting me know. I attempted to make almond butter a few times and have yet to be successful. So, I randomly searched sunflower butter and came across your recipe. I was a little scared after my failed attempts so I roasted about 1/4 cup of sunflower seeds then grind it up in my nutribullet milling Blade and used the extraction blade after. It wasn’t as creamy as yours but the coconut oil & honey gave it a great texture. Yes…high powered blenders are unique in that way Trisha! But the flavor still the same regardless…thanks for sharing your experience, glad u found one that works! Try the same.method for almonds, should work! I made this and was doing fine until adding coconut oil to the already smooth mixture. Coconut oil in cooler temps hardens; therefore, olive oil would be a better choice of oil unless you live in the tropics 365 days of the year. After the coconut oil, my batch turned to a clump of paste. you know Suzy…I have had issues with that when I add liquid sweeteners occasionally…I haven’t figured out why it seizes sometimes…but I have never had the issue with coconut oil. Strange! And if it is already smooth, no need to add extra oil…the oil is there as an option as some seeds have less oil than others and need the extra assist! I just added a ginger simple syrup and my lovely nut butter (for Christmas gifts) turned into a rock hard paste! Is there anything I can do?? Oh no Alicia!! I have finally learned that any nut or seed butter plus any liquid with enough water will cause the oils in the beautiful butter to “sieze”, the oils are literally clumping up together to get anyway from the water…to old adage that water and oil do not mix IS true in this case. I am not aware of anyway to fix this, I am SO sorry! Next time add a powdered sweetener or spice to avoid this. I’ve made this sunflower butter numerous times since I found your recipe while googling!! The BEST recipe out there! Whips up in no time and tastes so much better. So happy that I now don’t have to use store bought, I can make my own. Thanks Cassandra….the fresh IS infinitely tastier, I agree! Made this today and it is crazy delicious and addictive! I tried it as an experiment and just started with one cup of sunflower seeds. I have an inexpensive Black and Decker food processor and it whipped this up in no time. I used local honey and organic unrefined coconut oil with a pinch of salt. Heaven! Thanks Heidi…so much better than the store bought!! I used 2 1/2 c sunflower seeds to 5 TBS sunflower oil. I have a kitchenaid food processor and it took 10-15 min to churn with some patience but it paid off! Delicious. Thanks! Definitely some patience involved, thanks for telling us how it worked for you! With the high price of nut butters, this recipe is just what we need to benefit from them while saving a lot of money. I can’t wait to try this recipe. Would this method work with raw nuts and seeds? 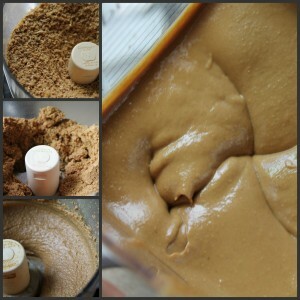 I have made my nut butters in my food processor or with my Twister Jar. Each nut and seed has a different fat content, and so sometimes you have to add some oil….but it does work! If you have a Blendtec, then have you considered reaching out to Blendtec for the new updated blender jars? I would love to see an update of your sunflower seed butter recipe using the Twister jar which they made specifically for nut butters. They should give you the jars for free in exchange for doing recipes with those jars. Many of us have the Blendtec but not the Wildside or Twister jars and are curious how well they work vs a processor which many people I know (including myself) don’t have. Hi Allison…I do have the Twister Jar. I like it for small amount of liquids….if you have small amounts of liquids…the larger jars don;t work as well. And while it works well with nut butters…I still prefer using my larger jar…otherwise I would have to make 3 batches in the Twister jar for the same amount. The wildside jar is great for larger amounts…I am glad I have all three…they all get mileage in my house! THANK YOU!! Worked like a charm in my Vitamix! 😀 Only needed to add 1 Tbl. of coconut oil. My house smells divine too. 😉 Awesome!! I tried making this in my Ninja food processor but the engine burned out. I put it in a cheaper brand food processor and the engine burned out of that one too. I only used 2 cups of sunflower seeds and its like the consistency of play dough 🙁 I even added more oil trying to get it to work, but it won’t change from the play dough consistency. What a huge bummer Blythe!! I am so sorry it did not turn out for you….i know some machines aren’t cut out for this heavy duty task, so thanks for sharing your experience. I have a pretty powerful blender so I’m hoping I can do it w/o a food processor. I know you recommend toasting the seeds, but I eventually want to make with sprouted/dehydrated SF seeds. Any suggestions for me? Hi Michele! Toasting the seeds is only for flavor, so if you like the raw flavor, forgo the toasting! Yes I did have success on my 2nd batch! I used the already toasted seeds from TJ’s and it worked very well. I used coconut oil and Stevia and salt. I did not use the blender step just the food processor and it came out well!It works well to cut the amt of seeds in half if you have a 7 cup food processor- you can do it in 2 batches and it will fill a regular sized PB jar! Yea! awesome to know, thanks Michele! Ugh! I tried to make this in my cuisenart and vitamix and it turned out like glue . Wasted a whole bunch of sunflower seeds! Huge bummer Barbara, always frustrating! If you provide me more details, I might be able to trouble shoot what went wrong…two best guesses would be the seeds themselves or the length of time whirred/heat issues. We have an Oster blender/processor combo, and it made very delicious sunflower seed butter. I started grinding up some sunflower seeds, but it was just a powder at first. I quickly googled sunflower seed butter and found your site. I added some coconut oil, and it turned out great! Thanks! redeemed Stephanie! I am glad to know the Oster worked! I just made the sunflower butter in my vitamix and it turned out perfect. This is the butter I’ll use from now on. Only thing is I only had sunflower seeds with salt so I used a little more honey to drown it out. Thanks alot. Should you soak the seeds before roasting them? Great Trisha, thanks for commenting! I have been making sun butter off and on since last year. Today I really had a taste for it, and stumbled upon your website. I decided to give it a try with warm raw honey, a little bit of cane sugar,a little bit of salt to balance out the flavor,and a little something different, organic coconut oil. It tastes pretty good, puts me in remembrance of the Chico sticks I used to gobble up when I was little. This is definitely a keeper. Glad you like it Michelle! Thanks for coming back and letting me know! Hi Sara! ANy oil will work great…but many times it is not necessary…so play it by ear! I certainly know the benefit of shaving a few dollars here and there as you can when you grocery shop with food allergies! I have to say I was not only delighted, my wallet popped out of my pocket and did a Snoopy dance on my desk! Well one day I found Sunbutter at our local supermarket and figured I’ll give it a try. It was amazingly like my old lost friend. The fact that it cost $7.00 for the same size jar that you would call the travel size Jif was a bit worrying. Then as I started to use it up, I realized why we bought those “bulk” sized jars of Jif before. That little jar I paid $7.00 for lasted me all of three days. I would have to rethink my sources. Well, I figured I could find a bulk supplier or cheaper brand. So off to Google. To my amazement, the cost online was at least as high if not more! Then I saw this link to recipes. I checked one, and it was more like hummus than peanut butter. I began to feel that sense of grief and loss some people associate with the passing of a loved one. Suddenly, I stumbled on your recipe. You crack me up Thom!! Glad you are so happy with this, yes Sunbutter is NOT cheap…I can barely keep ours in stock either…my kids are fiends for this stuff! I just finished making a batch of this and WOW! Thank you thank you thank you! Sun butter in the store here is very expensive and I usually can’t find the one without any added sugar at all! This was extremely easy and I followed your recipe exactly using my Cuisinart Prep 11 plus food processor! I actually skipped putting it into my Vitamix as well, because well…I just LOVED the texture as it was after the processor! Thank you again so very much for sharing your recipe! You’re welcome Angie, thank YOU so much for coming back and letting me know! Can’t wait to try this, almond or cashew butter are so expensive to make as nuts here are expensive, but sunflower seeds are very affordable. I did burn out the motor of my 20+ year old mini blender trying to make coconut butter, lets hope the new one can cope with sunflower seeds. Well I tried to just use my ninja food processor/blender to make this and it was fairly successful. Unfortunately my ninja is no more. I think I burnt out the motor. At least it made it to get this to a spreadable consistency and it is delicious. Oh no Destiny! Bummer! I had a Ninja for a month, but sold it promptly as I was totally underwhelmed with it’s performance….I am so sorry yours burned out! Maybe a Blendtec or Vitamix in your future??!! thank you for this recipe. I think what I will do is try this with the sunflower seeds I’ve purchased for snacks and then I will test it on my great nieces and nephews. And when I make my granola bars, I will use this instead of peanut butter to see how my test subjects like it. Hi Tessa, just came across this receipe and made it; however the color of my nutbutter is much darker and almost greenish, any clue as to why? It taste ok but not what I’m use to. Just wondering if I did something wrong.. Thanks! if you read in other comments Patsy, sunflower seeds are sensitive to pH levels…so any acid or acid residue will convert it the seeds into a green hue..totally harmless…and actually quite fun to play with around St Patty’s Day…we are talking BRIGHT green baked goods with sunflower seed butter and baking soda! If your seeds are darker, it mean that they have been more toasted…did you use roast your own seeds or pre-toasted? My daughter’s Kindergarten does not allow any tree nuts and she loves Peanut butter sandwiches so this recipe is perfect for us! I made the recipe with roasted unsalted sunflower seeds from Trader Joes and Coconut oil (looked online and said it was okay for those with nut allergies) in my Blendtec and it came out delicious! I ran it a few times to get truely creamy but it came out great and my daughter approves! She is very excited about lunch tomorrow, thanks! I should have done salt to taste instead of dumping the listed amount in the mixture, next time I might put less for sodium/ taste reasons, but my daughter did not complain! It took my kids a little bit bit of convincing change was good…but not much Courtney! Enjoy! I am an avid lover of peanut butter, but have been looking for healtier substitutes. I like almond butter, but it’s quite a bit more expensive. I haven’t tried making my own, but even almonds are rather expensive. This looks like a good alternative. Thanks for posting this. At first blender was unhappy. Then i took the mixture out and was inspired. I put a good inch of safflower oil in the blender, then started spooning the mixture in a spoon at a time and blending. awesome!!!! I feel like little house on the prairie! Cant wait to try with other nut butters. Way to be resourceful Alek! Adding oil is always an option, and the amount you add changes the end viscosity….every batch of seeds i do can be different, so sometimes I need no oil, and other times I can add several tablespoons! Tessa this looks soooo good! Thanks for sharing the recipe on Wildcrafting Wednesday! We have a peanut allergy in our house too. Thanks for the recipe share and for the other folks piping in with no-cross-contamination seed sources. Great just bought half a kilo just over a pound of sunflower seeds so will give this a go has to be better than the margarine with things you cant pronounce in them. Will report again later today. And in case anyone else is wondering, I used 2 cups sunflower seeds and it worked just as well. Thanks again!! Crazy how the two step process works so much better….in theory it should work in a high powered blender by itself, but I always get better results with the two step! Thanks for your feedback Nadia! Yes Amy….the roasting is KEY, so glad I was able to turn you on to the secret!! This is easily done in my Vitamix. No need for a FP. Debra C, could you please share how you achieved success just using a Vitamix? I tried this last week and the mixture got horrible results. The mixture would not get smooth, and the more I processed in the vitamix, the hotter it got until finally, the mixture separated into a gummy disgusting ball with the oil separated on the side. It also smelled rancid. I think I allowed it to get much too hot. I’d love to try again, but not sure where I went wrong? Sheryl, did you roast your sunflower seeds first? I made this yesterday in my food processor (someday I’ll own a high powered blender). Today I can’t walk pass my kitchen without stopping by my sunbutter and eating a spoonful. I used to do that with peanut butter as a kid but since my daughter was diagnosed with a peanut allergy I haven’t been able to indulge. I think I’m ready to buy more sunflower seeds to make more before I finish this jar. Yum! 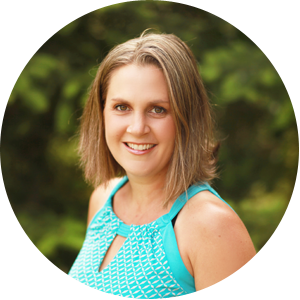 awesome to hear it Tanya….thanks for letting me know! Made this today and it turned out great! I only had 2 1/2 cups of seeds so I reduced the coconut oil to 2 TBLS and used 1/2 tsp salt. Taste is great, but it does have a pea greenish color. I only noticed when comparing my store-bought Sunbutter. Any ideas as to why? No worries Betsy! Sunflower seeds are sensitive to Ph levels, and will turn greenish in alkaline environments…it is normal and safe! months ago on sale and it has changed my life!! I use it every day! I have so many stomach issues and allergies. After having babies I started noticing that certain foods caused me extreme pains in my stomach, made my cheeks burn bright red, caused my face to break out, soy makes me get welts……. So I guess i have more intolerances than actual severe life threating food allergies but I have definitely found that I feel so much better if I live a life sugar free, gluten free,soy free, dairy free, egg free. Thanks for having this blog and for being you! Hi Carrie! My sons story is on my about page..plenty of things to list ! Three cheers for BlendTecs! Try attached link, less oil and more tips. Does roasting sunflower seeds not ruin them nutrition-wise? I make all my nut (almond, coconut, peanut) butters raw, but when I made raw sunflower seed butter the flavour was quite bitter. Hi Jessy! There are many opinions about that very issue. From what I can tell, antioxidants are reduced, and enzymes destroyed through toasting, but that does not crops cancel all the other health benefits of seeds and nuts. That’s my opinion though! I can imagine raw sunflower seed butter wouldn’t be tasty at all! I have a Viking Professional food processor. I just made this butter and it didn’t come out creamy at all, very pasty in fact. The greenish color is also very unappealing. I had the same effect when I tried to make cashew butter. I kept adding coconut oil and maple syrup but after a while it just became dry. Any suggestions? I really would like to provide nut butters for my family. Hi Nadia, bummer! Here are some thoughts: I have noticed that the mixture seizes or gets pasty/stiff when I add liquid sweetener. Was the there butter whirring smoothly before the sweetener was added? Strange on the green color….sunflower seeds react with acids to make a green color, but there are no acids in this recipe, not sure what happened there. -make sure you are processing long enough. The seed butter should go from flour, to clumping, to one bog ball, and eventually, as the oils release…nut butter. One you achieve the running smoothly stage, you still have to let it go a bit longer. -food processor cup capacity:I use a 12 cup size. Mif yours is smaller, use less seeds….they need enough room and power to get to seed butter stage. -do not add any salt or sweetener until it is ultras creamy, and then try stirring it in by hand as a very last step. I have hunch on this one…it sometimes happens to me, sometimes not, and I am still trying to puzzle out the science on it. I think maybe if it ahas not released enough of it oils (not processed long enough)it seizes and turns pasty. Hope this helps Nadia! So sorry it was a bust for you! Awesome Cate…I love mine super toasty too! I would only refrigerate it if it does not get consumed within two weeks Anne. Any nut or seed butter will go rancid overt time in the pantry! I’ve been eyeing sunbutter for awhile but the Trader Joe’s brand has added sugar and the others are so expensive. You’ve convinced me the flavor is worth making it at home. I already make my own almond butter, which is so easy, so I’ll just add this into the rotation. Thanks, Tessa! If you look at sunflower butter compared to almond butter at TJ’s its about the same sugar. Its just that sunflower seeds have no sugar and other nuts do. My boyfriend is allergic to peanut butter, and I am sorely missing my peanut butter topped english muffins for breakfast! I’m definitely going to have to try this out soon. 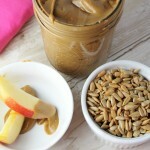 Do you know if there is any health benefit to sunflower seed butter compared to peanut butter? Hi Chelsea..sunflower seeds are different than peanuts..peanuts are legumes. Her is a wiki excerpt: From a nutritional perspective, sunflower butter contains almost four times as much vitamin E as peanut butter, and about twice as much iron, magnesium, phosphorus and zinc. 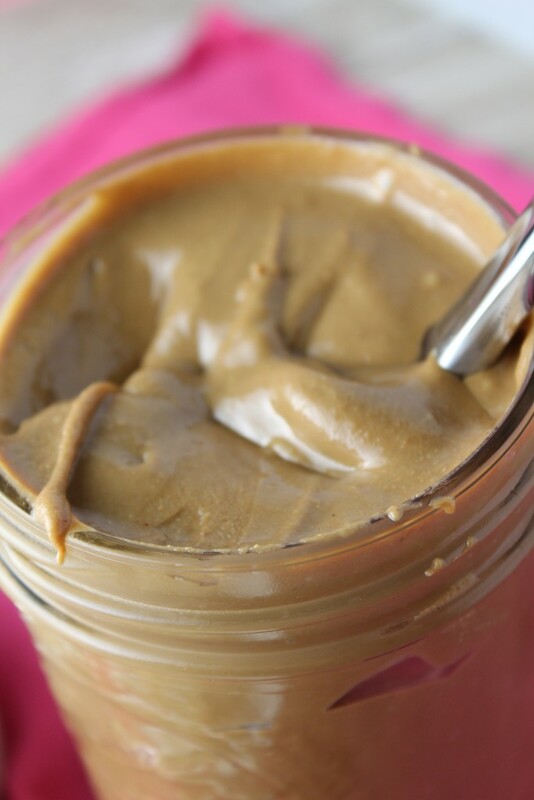 Peanut butter contains higher levels of protein and slightly less sugar and fat. I am excited to make this for my son who has a peanut allergy, but am wondering how long this will stay good for in the fridge…? Awesome Kelly! We must have been on similar wave lengths, I made another batch today too! Thank you so much for taking the time to give your feedback, it is valuable! I see some people asking about using a vitamix and not a food processor. This is what I do. I bought a $19 coffee grinder on Amazon. I put the sunflower seeds in a pan on the stove top. In less than 10 mins you can have them nice and golden brown. Just keep moving them around in the skillet. Put the seeds(they wont all fit at once) in the coffee grinder. Grind them for approx 12 seconds til you have it to a powder. Put the powder in your vitamix and blend on #5 for approximately 30 seconds. Wait a min. Keep doing this 2 – 3 more times and there you go your sunbutter is done. Thanks for your tips Mike! Would this work with hulled seeds? It looks delicious! Yes, that is what I use! Whole sunflower seeds with the black shells would not work here! Hmm, strange..that very thing has happened to me with random batches of coconut butter….but never this. It might have something to do with the doubling and the mixture never getting enough movement or heat to create the butter. Try a single batch…or try working with half of the mixture you have and see what happens. Let us know! I saw this post on Real Food Wednesday. Yumm! I have to try this now! I don’t like buying sunflower butter but I love the taste of it. It would be the perfect breakfast on the go for me on a sour dough spelt toast and bee pollen sprinkled on top. Oh I simply cannot wait to try this!! – will soak//dehydrate my seeds first…thanks for cracking the code! Yum! I need to make some! Hi this sounds great, I’ve been planning on making our own sunbutter for a while now. Only problem is that we don’t own a food processor, only a Vitamix. Is there any way we can make this entirely with the Vitamix blender? Hi Liza…I talked about this in the post…the high powered blender just gives you the extra creamy part, but before i started using both appliances, I just did it in my food processor. It will not get quite as creamy, but is is still just as delicious. In general, the longer you process, the smoother it will be, so plan on at least 10 minutes of processing! Without a food processor, I am not sure it would work, but I do not have other appliances to test that out! I had great success with my Vitamix. It took about two minutes. I know all about those hives and PB 🙁 I love sunbutter, I need to try to make out own! 🙂 YUM, got this tweeted and pinned! That does look creamy! I am impressed. Thanks so much for sharing this on Natural Living Monday! I was shopping the other day and thinking about buying some sun butter but it was OUTRAGEOUSLY expensive! I will definitely have to make some. What a great idea,my family is going to just love this, as they just love their sunflower seeds. Enjoy your weekend and thank you so much for sharing with Full Plate Thursday. YUM, this looks divine. I love that it’s extra creamy. I think it would make cookies that use sunflower seed butter extra delicious!! Can’t wait to try it! Thanks for looking out for those with nut allergies — this is going to come in handy for some dear friends of mine. It is good all by itself too Lindsey, enjoy! I want to try this, but may have to get a better processor. I bought cheap one that has worked well so far, but it may not be powerful enough for this. Please let us know how it works Elisa, I would be curious to know which models work and those that do not! Where do you purchase your raw sunflower seeds? I have had a hard time finding some that has not been contaminated with peanut or peanut oil. Geez Tammy & Kelly, I had never even heard of cross contamination issues…my son can’ EAT sunflower seed butter yet either…thanks for the heads up! I have been purchasing through iHerb and Amazon, now I will check to see where they are processed! I don’t know where you live but if you have a Trader Joe’s nearby they sell “clean” sunflower seeds, raw or roasted, for about $2/lb. That’s where we buy our seeds! Oh, also Gerb’s brand is safe. You can buy them on amazon or directly from their website. There’s usually a 20% off code floating around. They have both pumpkin & sunflower seeds. But they are more expensive than TJ’s. Awesome Laura..I do buy then at TJ’s too…I have just never looked to see if they were in a clean facility! I will be now! Where do you find the sunflower seeds that are not cross-contaminated with peanuts? We love sunbutter, and I would love to make my own. I am stopping over from the blog hop at Frugally Sustainable. I’ve made my share of homemade nut butters with wonderful success…I’ve never tried sunflower seed butter. I can’t wait to try this…I love Sunbutter but it’s hit or miss to find the organic one without added sweetener, and sometimes the taste is a bit off. This will be perfect with my Gooey Sunbutter Brownies! I really want to try this Tessa! I wonder if my blender is powerful enough though. Still no reason not to try! Thank you for the great directions and pictures! What kind of blender do you have Vicky? What a rocking recipe Tessa! I spend waaaay too much on SunButter which my kids adore. I can’t wait to make my own thanks to your recipe and fabulous instructions and save a little bit at the same time! Yay Laura…let me know how it goes and what you think! Hmmmm I might have to invest in a food processor. I do make this in my Vitamix, but I have to use almost as much oil as sunflower seeds (Ok, maybe half as much!) to get even remotely creamy. Not that I mind using that much oil, but if I don’t have to, that would be great! Yes Anne, I find the combo of the two to be best…my Blend Tec seems likes it is almost going to overheat when I have tried in the past! I just made this in my Vitamix and it was quick and turned out perfectly. I think that being able to move the mixture with the tamper really helped. Also, I made a half batch to allow for more movement. It was so fast that if I wanted more, I’d just make two batches I’m succession. One thing I have not tried is making my own nut butter, but I do like sunflower seed butter. I’m intrigued at the flavor difference and I’ll be trying this very soon. You said to toast the “unhulled” sunflower seeds — does that mean with or without the hulls? Hi Karen, unhulled! You see them in the picture…..
Then I think you mean “hulled” as “unhulled” means with the hulls still on. 🙂 Thanks for the recipe! HILARIOUS Julie!! Can you imagine someone trying to make this with the whole seed?! hanks for catching my typo! This is the best butter I have seen. I am going to try it soon. Well i am glad it LOOKS good, but really, I want it to TASTE good Balvinder! Let me know how it goes! Sunflower seed butter might work…nut butters are more challenging, the seeds are softer Rachael! What blender/food processor do you have? I tried this and failed miserably with mine. We go through 2 jars a week so I am thinking this would eventually be a money saver if I made the investment of a good food processor. Hi Kelly, I used a Cuisenart 14 cup processor, I inserted a link in the post for you! I adore mine and use it daily!! I was super excited to try this recipe and alas, my food processor was entirely too crappy to pull this off. It turned into weird oily hard/granular glue. Maybe one of these days I’ll be able to buy a vitamix and none of these issues will be a concern. Hi Sabrina….it should work in a food processor….what kind do you. Have? I would add more oil and just keep letting it whir and see if it finally succumbs….it is possible your processor is too weak, but worth a shot. What a bummer, sorry! If you take a I’d and share it on my fb page, I could Hazard a reason…. Hi, If you try it again, it really takes a lot longer to blend than the 10 min. Just keep stopping the food processor brake up the clumps and it will eventually smooth out. But I takes time and patients. I imagine different brands and styles of food processors would effect the process time, you bet! Mine takes under ten minutes. I use the Trader Joes Unsalted Roasted seeds too.